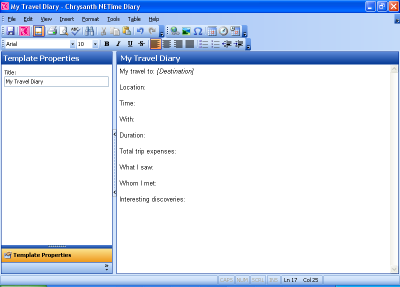 Off and on, you may find yourself writing diaries with very similar content structure (such as a travel diary or etc). When it happens, sometimes it would be pretty frustrating to have to refer to the previously written diary format in order to keep them in a consistent way. diary template for "My Travel Diary"
After this is done, save the diary template and it will be ready for use in the next section. 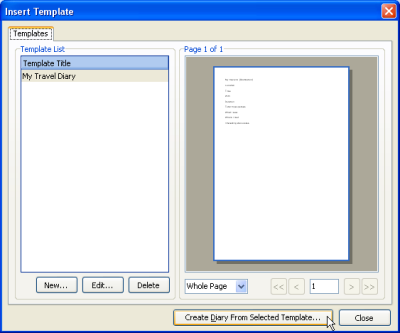 To write a new diary using one of the diary templates, all you have to do is start by selecting a proper diary template via Select Template... menu. A dialog with a list of previously saved diary templates will be shown, from which you may make your selection and have a preview on it. 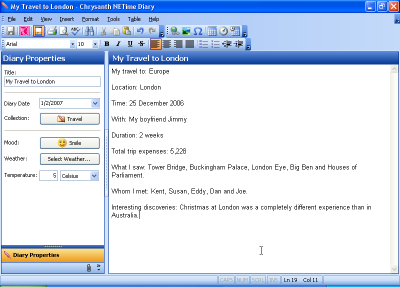 Click Create Diary From Selected Template... button to recall the diary template as the base for your new diary. Once a diary template is selected, you may start writing your new diary and will be sure that the new diary will look in much the same way as other diaries which are of the same genre. This would save you a good deal of time trying to ascertain your diary writing styles of particular topics are always in sync.